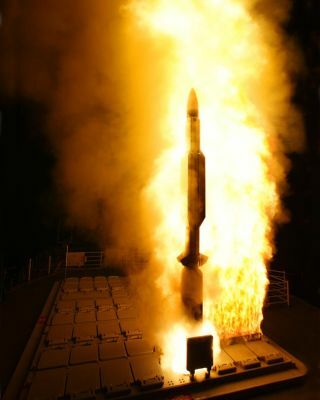 A Standard Missile-3 (SM-3) is launched from the Pearl Harbor-based Aegis cruiser, USS Lake Erie (CG 70) on November 6, 2007 enroute to an intercept as part of a Missile Defense Agency test. A similar missile will be used to shoot down a crippled spy satellite in coming weeks. With thesuccessful landing of space shuttle Atlantis this morning, U.S. DefenseDepartment officials said the window of opportunity is now open for attempting toshoot down a wayward spy satellite. But expertsquestion the stated motives and whether the potential benefits outweigh therisks. Thesatellite USA-193, also known as NROL-21, was launched into orbit Dec. 14,2006. Shortly after it reached orbit, ground controllers lost contact with it.Though the satellite's objective is secret, many figure it is a high-resolutionradar satellite intended to produce images for the National ReconnaissanceOffice (NRO). ThePentagon plans to shoot it down,convinced its toxic hydrazine fuel poses an unacceptable risk to people on theground. Currently, three U.S. Navy ships ? the cruiser USS Lake Erie and thedestroyers USS Decatur and USS Russell ? are posted in the Pacific Oceanwaiting for an optimal time to launch. The Erie will get one 10-second windoweach day over the next 10 days or so to fire one of its two SM-3 missilesbefore the defunct satellite tumbles to Earth, according to the American ForcesPress Service. The Decatur is also fitted with an SM-3 missile. But formerassistant secretary of defense Philip Coyle doesn't buy that rationale. "Thespy agency doesn't want some part of the satellite to fall into the wronghands," said Coyle, now a senior advisor to the Center for DefenseInformation. "I don't think that's being emphasized enough as a motivationfor NRO to want this thing to be shot down." "Numbertwo, poke the Chinese, because we're showing them not only that we can shootdown a satellite in a test without creating a lot of debris like they did. Butwe're also showing them we can do it any place in the world, because we'redoing it from the ocean," Coyle said, referring to a similar satellitedestruction by the Chinese. "And a third reason is to show off ourmissile-defense capabilities such as this, though this is much easier thanhitting an enemy warhead." Warheadsmove more erratically and are much trickier targets than a predictably movingsatellite. Even so,there is a chance of missing the satellite all together, for one because it'smoving so fast. "Theclosing speed between the missile and the satellite is going to be very high,much higher than they might have in a missile engagement," said Coyle, whois also past director of the Operational Test and Evaluation program in theDepartment of Defense. "So that's another reason why they might miss isbecause they've never had experience trying to hit something moving so fastbefore. Still I think it should be relatively straightforward." Thesatellite and missile would close on one another at a velocity of about 22,783mph (36,667 kph). Hitting thebus-sizedtarget is just half the battle. To be completely successful, the missilemust also destroy the satellite?s fuel tank, which holds about 1,000 pounds(454 kilograms) of toxic hydrazine. Pentagonofficials have argued that if the satellite were to fall through the atmospherewith no missile interference the hydrazine tank could survive the fiery descentto reach Earth's surface intact, spewing toxic gas over an area about the sizeof two football fields. Those who inhaled it would need medical attention. ?In thiscase, we have some historical background that we can work against for the tankthat contains the hydrazine," said Marine Gen. James E. Cartwright duringa Feb. 14 press briefing. "We had a similar one on Columbia that survivedre-entry. We have a pretty reasonable understanding that, if the tank is leftintact, it would survive the re-entry.? However,destroying the fuel tank and dispersing the hydrazine requires a direct hit onthe possibly tumbling satellite. The high closing speeds for the satelliteintercept and the uncertainty of puncturing the fuel tank could make that goalquestionable, according to an analysis done by Geoffrey Forden, an MITphysicist and space expert. "Ifthey do shoot at it, even if they hit it, there's just a 30 percent chance thatthe shrapnel connected by the intersection hits the hydrazine tank,"Forden said. ?As wereviewed the data, if we fire at the satellite, the worst that could happen isthat we miss,? Cartwright said. ?Then we have a known situation, which is wherewe are today.? He continued, ?If we hit the hydrazine tank, then we?ve improvedthe potential to mitigate that threat. The regret factor of not acting clearlyoutweighed the regret factor of acting.? Theywouldn't know for at least a day whether the tank had been destroyed, saidPentagon Press Secretary Geoff Morrell. Coyle, theformer Defense Department official, doesn't think the hydrazine tank is a bigenough safety issue in the first place, stating that the U.S. produces about 36 million pounds (about 16 million kilograms) of hydrazine each year. "Ifwe're so worried about hydrazine we oughtn't to be trucking it around on U.S. highways and on rail cars the way we do, if that's really our concern," Coyletold SPACE.com. "So if we're really worried about safety, putting afew dollars into a school-bus crossing some place would probably be a betterinvestment than $60 million for this test." During aTuesday press briefing, Morrell denied that this is a test of the United State?s anti-satellite capabilities. ?Thisoperation is designed to alleviate a threat to human beings on this planet.There is a large tank of hydrazine fuel onboard that satellite that would posea significant threat to people within the immediate vicinity of it if it wereto hit land,? Morrell said. ?So not wishing to take that risk, the presidenthas asked ? ordered ? this department to shoot down that satellite." The plancomes on the heels of the intentionaldestruction last year of China's Fengyun-1C weather satellite, whichproduced a flurry of concern over the hostile-or-not nature of the firing aswell as a serious load of shrapnel littering Earth orbit. That debris is stillin space, frustrating mission managers and satellite operators forced to dodgethe potentially debilitating bits. The U.S.Defense Department plan, however, was made public to the internationalcommunity. ?Thisannouncement demonstrates openness about a sensitive subject that isappropriate to a democratic society,? said Ray Williamson, Executive Directorof the Secure World Foundation in Colorado. However,Williamson added, ?I fear that using a ballistic missile in this manner afterthe United States roundly chastised the Chinese government for itsanti-satellite (ASAT) test just over a year ago sends completely the wrongmessage to the world community.? Theattempted shoot down of the satellite will undoubtedly send a politicalmessage. Both Russia and China have expressed concerns regarding the U.S. attempt, with Russia labeling it a weapons test of the missile defense system. "Thetiming of it is very interesting, coming after [the Russia-China] proposal onbanning space weapons," said Roger Launius, National Air and Space Museum senior curator. He added that the U.S. attempt could be a response to China's anti-satellite test last year that "we can do this too," and take outsatellites if necessary. "Thepotential political cost of shooting down this satellite is high," saidLaura Grego, an astrophysicist with the Union of Concerned Scientist's GlobalSecurity Program. "Whatever the motivation for it, demonstrating ananti-satellite weapon is counterproductive to U.S. long-term interests, giventhat the United States has the most to gain from an international space weaponsban. Instead, it should be taking the lead in negotiating a treaty." A U.S. attempt that fails to destroy the satellite could also send a message ? although not one the U.S. would like. China and the rest of the world could assume the miss was a fluke, or theycould also see failure as evidence that the U.S. technological lead in spacehas declined, according to Launius. The U.S. may find itself in a difficult position by going ahead with the attempt, even giventhe real danger of the satellite's hazardous payload falling to Earth. Fordencalculated the risks of the hydrazine tank killing or injuring someone at 3.5percent if it survived re-entry. However, he stated his belief that thepolitical consequences of the attempted shoot-down could be worse, by furtheropening up the international arena for future anti-satellite tests and possibleconflict in space. "Youhave to weigh the chance of [the satellite] killing or injuring someone againstlegitimizing China's ASAT [anti-satellite] test," Forden said. "Athree percent chance of killing or injuring someone is large, but theconsequences of allowing China to go ahead?I still come down and say it's a badidea." The futureof space as a battlefield could mean clouds of debris from destroyedsatellites. That would add to some 17,000-plus objects that are already beingtracked by the U.S. Space Surveillance Network. According to the NASA OrbitalDebris Program Office at the space agency?s Johnson Space Center in Houston, Texas, for the past 45 years, the average number of cataloged object re-entrieshas been one per day. "Stuffwill hang up there until gravity brings it down," noted Launius. "Ifyou get enough of that up there, just getting through it could be an issue formission launches." Vote: Which Cosmic Duo Would You Trust to Destroy a Wayward Spy Satellite?